The Hoosiers are the No. 10 seed in the Big Ten Tournament. 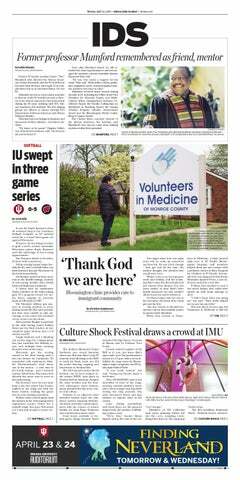 IU is headed to the Big Ten Tournament, finishing 4-7 in conference play. The Hoosiers need to stay within the top 10 of the conference to qualify for the Big Ten Tournament. IU plays its final two home matches of conference play this weekend. Natalie Whalen suffered a back injury her freshman year that left her future in tennis uncertain. The doubles point proved to be the deciding factor in this year's rivalry. The away team has won the past two meetings between IU and Purdue. IU hosted a pair of matches this weekend where it beat Iowa and lost to Nebraska. IU is ready to show why it deserves respect in the Big Ten conference. The Hoosiers won their conference home opener on Sunday. IU heads to Michigan State for its final game of a three game road swing to open up Big Ten Conference play. IU lost to Northwestern, its second straight loss against a top-six nationally ranked team. The Hoosiers are in Big Ten conference play for 11 of their 12 remaining regular season matches. IU tied its most non-conference wins in four years over the weekend. IU plays its final doubleheader of the season Saturday. Princeton was the first ranked opponent IU has played this season. IU heads northeast to compete with teams from the Ivy League. IU loses its first game on the road. Women's tennis is on the road for the first time this season. It was close, but IU fell for the first time this season against Tennessee.